At least seven people were killed in an attack against Israeli youth on a tour bus in Burgus Airport in Bulgaria. Reports claim the attack was most likely carried out by a suicide bomber, who was either next to the bus or who got on the bus. According to nrg, a female suicide bomber stood next to the front of one of the buses and activated the bomb. Israeli Prime Minister Bibi Netanyahu stated that “all signs point to Iran” and that Israel will respond fiercely. We passed immigration and got onto bus #4 outside the airport. We placed our bags, and after two minutes bus #2 went up in flames. We were evacuated into a secure room. Survivors from the bus had to jump out of the bus so as not to step on bodies. We saw the bus, one Israeli took a photo of it. We saw its trunk explode. We were quickly rushed into the terminal. 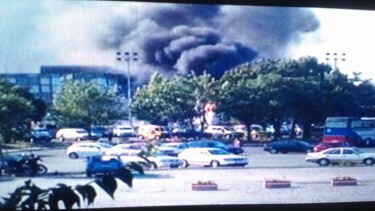 I just spoke with Bulgaria's foreign minister, Nikolay Mladenov, about the blast. Mladenov is heading to the location and will give me updates when he gets there. Excellent live blog coverage on Haaretz in Hebrew (more frequent updates) and in English.